Expropriation of Monastery Land Seen as Effort to Squash Syriacs. Not even the Mongols of the 14th century, when they killed 40 monks and some 400 faithful, succeeded in making one of the most ancient Christian convents in the world disappear, but perhaps Prime Minister Recep Tayyip Erdoğan of Turkey, can. This appears to be the case of the Syro-Orthodox Monastery of Mor Gabriel or "Dayro d-Mor Gabriel," called "Deyrulumur" in Turkish. It is located in the region of Turabdin in the southeast of Anatolia. 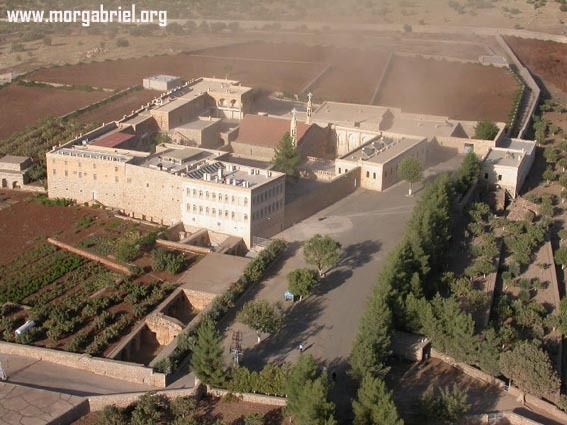 The convent bears the name of Mor Gabriel (634-668), bishop of Turabdin, known for his witness of holiness and miracles. The foundation of the monastery, which is situated southeast of the city of Midyat, in the province of Mardin, near the border with Syria, dates back to the year 397 A.D. and was the initiative of two monks, Mor Samuel and Mor Simon, who died in 409 and 433, respectively. The complex, which boasts elements built with the help of Byzantine emperors such as Arcadius (395-408) and Theodosius II (408-450), today houses a small community of three monks and 14 sisters. Mor Gabriel, known also as the "second Jerusalem," is not only a monastery. Mor Gabriel is in fact the See of the Metropolitan Mor Timotheus Samuel Aktas and the cultural and spiritual center of the dwindling Syro-Orthodox community of Turkey and of numerous Syriacs who've emigrated to the West. Just 50 years ago, some 130,000 Syriacs lived in the region of Turabdin -- the name means "mountain of the servants of God" -- but today their number has decreased to just a few thousand. The monastery is at the center of a harsh battle initiated in 2008 by the leaders of three Kurdish villages dominated by a tribe supported in Parliament by one of their leaders, Suleyman Celebi, who is a Parliamentarian with the pro-Islamic ruling party of Erdogan (the AKP or Party of Justice and Development). Several accusations have been leveled against the monastic community, including proselytism, which is based on the fact that young men study Eastern or Syrian Aramaic at the monastery. There are also claims that the monastery was built on a place where a mosque once stood -- an unfounded and even absurd accusation, given that Mor Gabriel well precedes the birth of Islam. The accusation that sticks -- at least in the eyes of Turkish officials -- is the one upheld by the Treasury Ministry: undue appropriation of land. Even this accusation is not very comprehensible, given that the community of Mor Gabriel regularly pays the taxes on the land in question. The affair has recently met with, perhaps, its definitive conclusion. With a decision made public on Jan. 27 (but that actually dates to Dec. 7), the "Yargitay" or Ankara Court of Appeals -- Turkey's highest appeals court -- overturned a verdict issued on June 24, 2009, by the court of Midyat. According to the Yargitay decision reported by Forum 18 News Agency, 12 plots of monastery land with a total area of 99 hectares (244 acres) are to be considered "forests" and hence belong "ipso facto" to the Turkish state. For Mor Gabriel, the decision is a hard blow. To lose the lands means to lose the means of sustenance necessary for survival. While sources close to the Forum 18 agency described the decision as "highly political and ideological," the whole affair was described from the beginning as "a spectacle trial" or "farce." "The purpose of the threats and the lawsuit seems to be to repress this minority and expel it from Turkey, as if it were a foreign object," the head of the Aramaic Federation, David Gelen, told AsiaNews back in 2009. "Turkey must decide whether it wants to preserve a 1,600-year-old culture, or annihilate the last remains of a non-Muslim tradition. What is at stake is the multiculturalism that has always characterized this nation, since the time of the Ottoman Empire." The decision caused little upheaval in European environments, with the exception of Germany, where several parties, including the Social Democratic fraction in the Bundestag (Lower Chamber) and even Die Linke (the Left), denounced it. "The fraction of the SPD expressly condemns the expropriation because the surrounding land is fundamental for the life of the monastery. The Mor Gabriel monastery deserves our protection," stated a Feb. 1 communiqué signed by Christoph Strasser and Angelika Graf. Strong words were also used by Erika Steinbach, spokeswoman of the German parliamentary group for Human Rights and Humanitarian Aid, who called it a decision that symbolizes "the repression of Christianity in Turkey." "The negative trend in religious freedom in Turkey is incompatible with human rights," said Steinbach, according to the Assyrian International News Agency. In an article published Feb. 7 by the Norwegian Forum 18 agency, Otmar Oehring, director of the Human Rights Office of the German Catholic organization Missio, analyzed the situation of various religious communities in Turkey, including the Mor Gabriel affair. According to Oehring, the basic problem is simple: no religious community exists or has ever existed for Turkish law. For now, representatives of many religions prefer to stay silent. They fear -- as the case of Mor Gabriel demonstrates -- attracting the hostility of the authorities and having to face long and above all costly legal battles, only to lose their "de facto" liberty, Oehring surmised. For the author, the only solution to undo this knot that is "completely incompatible" with the European Convention on Human Rights and Fundamental Freedoms, is a change in the Constitution and criminal code of Turkey. This was also admitted last October by the then head of the "Diyanet" (Directorate for Religious Affairs), professor Ali Bardakoglu. "The solution is to allow a religious institution to be autonomous. Turkey is ready for this," he said, according to the daily Radikal. The following month, Bardakoglu lost his post. For the monks of Mor Gabriel, the only way not to lose their land is, therefore, to follow the example of the Ecumenical Patriarchate of Constantinople and turn to the European Court of Human Rights in Strasbourg. Metropolitan Samuel Aktas told the Economist that is just what he's going to do: “I have remained silent in the face of these injustices; but no longer so."